"Story about Shawn, a Dragonblood student at Raekos University"
CotF is an ongoing story about Shawn, a Dragonblood student at Raekos University. Shawn is a Nedrak, one of the richest and most powerful races in Khartan. The Nedraka are only one of several Dragonblood races, but they claim to be the only true descendants of the dragons that were the first inhabitants of Earth (hence the name, Children of the First). Other races have varying degrees of resentment or acceptance toward the Nedraka, who treat the other races as inferiors. Shawn doesn’t like how the Nedrak hold themselves in such high regard, and rejects a lot of his culture and religion. The story follows him as he deals with his heritage and his new college career–the pressures his family and other Nedraka put on him to their standards and expectations, his desire to be accepted by students of other races, and his struggle to find his place in the university. 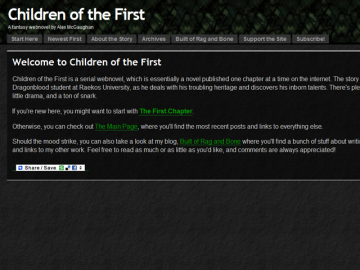 Children of the First has not been tagged yet. Help others find Children of the First by tagging it! Children of the First has not been reviewed yet. Children of the First has not been recommended yet.